This is the seventh successive week of Friday protests and Tuesday's resignation of long-serving President Abdelaziz Bouteflika does not appear to have satisfied the demonstrators. According to the constitution, parliament's speaker should take over. The president, who had been in power for 20 years, said this week that he was "proud" of his contributions but realised he had "failed in [his] duty". 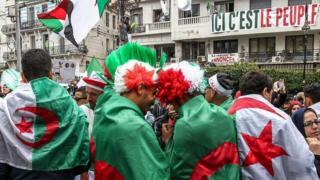 He added that he was "leaving the political stage with neither sadness nor fear" for Algeria's future. "We are tired of this regime, they have robbed us. We've had enough of that," an emotional young woman tells me. Everybody here wants a change. They are sending a clear message: "a new phase with new faces". They tell me they don't trust anyone associated with the Bouteflika era. It seems the powerful military agreed. Its chief, Lt Gen Ahmed Gaed Salah, said on Tuesday: "There is no more room to waste time." The demonstrators are pushing for the removal of three people they dub the "3B". That is Senate Speaker Abdelakder Bensalah, head of the constitutional council Tayeb Belaiz and Prime Minister Noureddine Bedoui.